Russian companies managed to strengthen business ties at the St. Petersburg International Economic Forum, with a number of major deals being signed in the oil and gas spheres, despite the continuing political standoff between Moscow and the West. While this year’s forum was attended by the heads of BP, Shell and Alibaba, influential world leaders were conspicuous by their absence, with Greek Prime Minister Alexis Tsipras the most important political guest. Despite chilly relations with the European Union and the United States, Russian companies managed to forge several important business deals at this year’s St. Petersburg International Economic Forum. The latest edition of the annual event, held in Russia’s second-largest city from June 18-20, resulted in the signing of a total of 205 agreements worth 293.4 billion rubles ($5.4 billion), according to presidential advisor Anton Kobyakov. He specified that these figures were based on “agreements, memoranda, contracts, framework cooperation protocols and declarations of intent” where they were not covered by trade secrets. 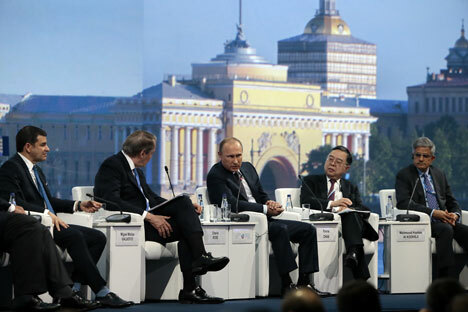 However, the sum was smaller than at the previous three forums and credit transactions were thin on the ground, with the sanctions imposed against Russia in 2014 over Moscow’s role in the Ukraine crisis continuing to cast a shadow over the event – on the eve of the forum the European Union voted to extend the sanctions until January 2016. Although the heads of some of the world’s biggest corporations attended the event, including Alibaba founder Jack Ma, former British Prime Minister Tony Blair, Shell CEO Ben van Buerden and BP’s executive director Robert Dudley, the most important political leader at the forum was Greek Prime Minister Alexis Tsipras. By comparison, as Ilya Balakirev, an analyst with investment company UFS, pointed out, the main guest at the 2013 forum was German Chancellor Angela Merkel, while the 2010 event was attended by the then-president of France, Nicolas Sarkozy. In this light, the 2015 forum will be remembered principally for the series of direct contracts and agreements concluded at the event, with Gazprom and Rosneft being the main participants. The forum's largest announced deal was the signing of an intergovernmental memorandum between Russia and Greece to build an extension of the Turkish Stream gas pipeline through Greece. The document provides for the creation of a joint venture project, in which each country will get 50 percent. The bank VEB Capital, which will own the Russian share in the new company, will provide 2 billion euros. The agreement with Greece is important for Gazprom, as its Turkish Stream project should exclude Ukraine from the gas transit route to Europe after 2019. The Nord Stream pipeline also received its continuation at the forum, with Gazprom CEO Alexei Miller signing a memorandum of intent to expand its capacity with E.ON, Shell and OMV. Two branches will be added to the pipeline, with a capacity of 55 billion cubic meters per year. So far, the companies have not created a joint venture, but Miller estimated the transaction amount at 9.9 billion euros. Given the fact that the monopoly’s stake in the project amounts to 51 percent, the Russian company accounts for nearly 5 billion euros’ worth of investments. The two branches of the pipeline will pass under the Baltic Sea, with Germany being the endpoint of the gas supply. The new pipeline is intended to help the concern to end the transit of gas through Ukraine after 2019, when the current transit agreement expires. Miller and Russian Energy Minister Alexander Novak repeatedly stated this year that the Russian side had no plans to renew its contract with Ukraine. Russia's largest oil company Rosneft signed 57 agreements at the forum. The main deal was the sale of a 20-percent stake in the Taas-Yuryakh oil-and-gas field to BP for $750 million. This is the first major deal between Western investors and a Russian company since the introduction of sanctions against Russia by the European Union and U.S. The field has reserves of 134 million tons of oil and gas condensate and over 155 billion cubic meters of gas. It is connected with the Eastern Siberia–Pacific Ocean oil pipeline by a separate spur. Rosneft spokesman Mikhail Leontyev told RBK that Skyland's beneficiaries are known to the Russian side; it is registered as a British company with Asian investors. Another key deal at the forum saw Rosneft and French petroleum giant Total sign an agreement for the sale of 16.66 percent of a refinery in Schwedt, Germany. “The sale of a minority stake of the Total refinery in Schwedt meets the goal of the concern to reduce our European refining and petrochemical capacity by 20 percent by 2017,” said Patrick Pouyanne, president and chairman of the board of directors at Total. In 2014, the volume of supplies of Rosneft crude oil to Germany amounted to about 20.3 million tons, which accounted for almost a quarter of Germany's oil imports. The forum also saw developments in the atomic sphere, with Russia’s state corporation Rosatom and Saudi Arabia inking an intergovernmental agreement that gives Russian nuclear technologies access to the Saudi market. The document creates a legal basis for collaboration between the countries in the peaceful use of nuclear energy for the first time in the history of Russian-Saudi relations. Riyadh is planning to construct 16 nuclear power reactors at a cost of up to $100 billion, Rosatom CEO Sergei Kiriyenko said in an interview to the Rossiya 24 TV channel. Based on reports by RBK, Kommersant and ITAR-TASS.